T.empf.39 "L" - this is a printer-only model, used in combination with the 72 "GL" and "73 "AGL". 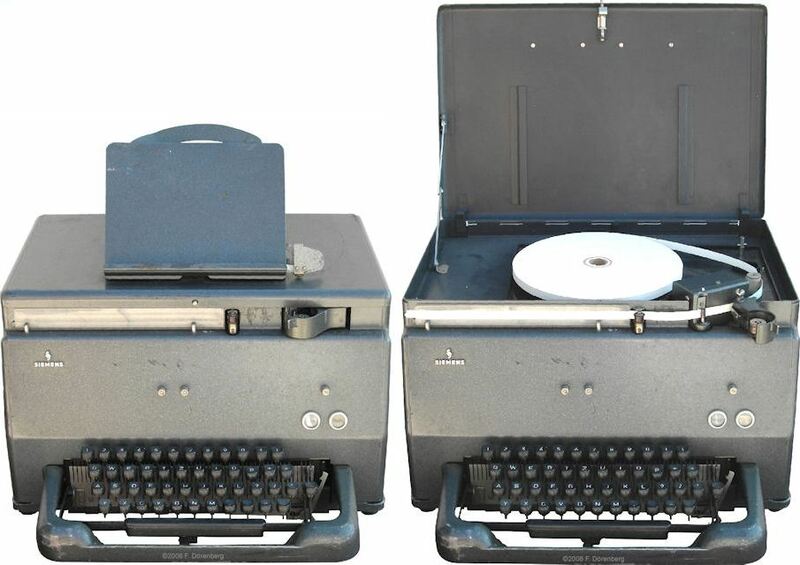 T.typ.72 "GL" - an expansion of printer model "L" with a Hell-sender ("Geber"). This sender/printer has an integrated keyboard. 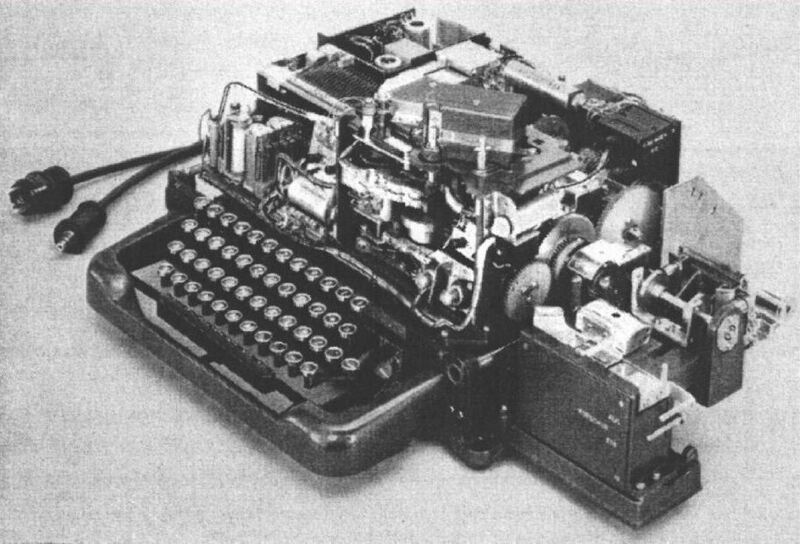 T.typ.73 "AGL" - an expansion of model "GL" with a punch-tape reader attached to the side of the unit. The same punch-tape unit can also be attached to a "GL". 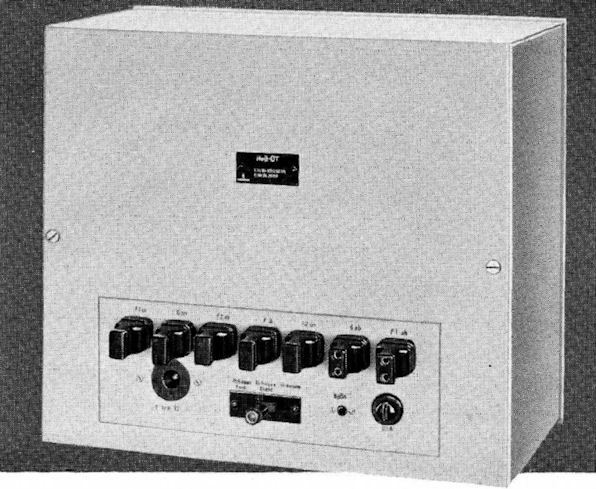 These models were intended for broadcast- and command/control-networks over existing telephone lines (unlike "telex" teleprinters), and over radio channels with "phone-line equivalent" audio quality. Broadcast-networks targeted by Siemens were those of stock markets, financial and commodity markets, international shipping departure & arrival information, and police (e.g., "wanted" warrants). Command/control networks were those of railway systems, fire departments, and electrical power nets. Ref. 1A. The German national railway system (Deutsche Bahn, DB) was the largest customer of . 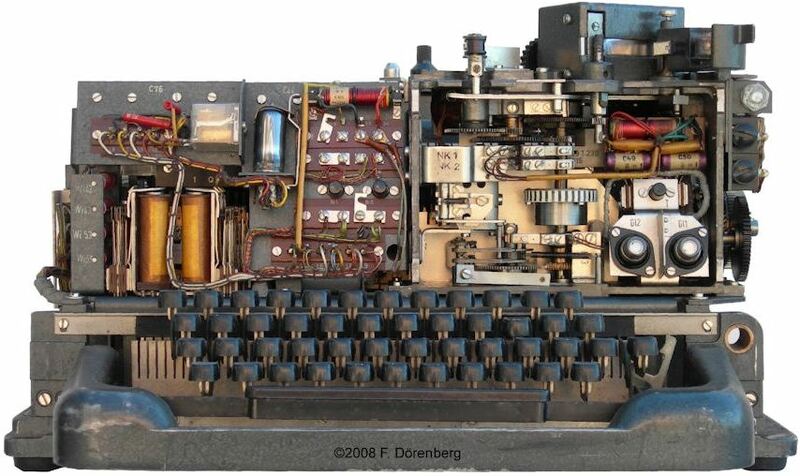 Starting 1955/56, DB began to replace their 6000 Morse-telegraphy stations with 1300 Hellschreibers model T.typ.72 "GL", T.typ.73 "AGL", and printer-only model T.empf.39 "L". 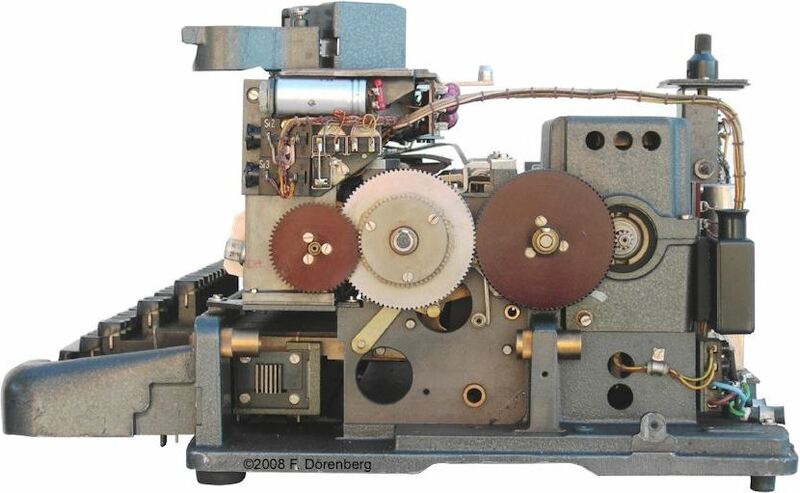 This allowed DB to reduce the workforce of their teleprinter service ("Fernschreibdienst") by 400, and save 80 thousand Morse-code training days per year. Combined, the savings amounted to about 1 million Deutsche Mark (DM) per year (ref. 2A, 2B). Based on the development of the German consumer price index since 1955, this is equivalent to an estimated 3.7 million Euros in 2015 (ref. 3A-3C). Note that teleprinter equipment prices do not necessarily follow the general cost of living inflation. In 1954, DB paid 1000 DM for Hellschreiber printers (ref. 4A) - about 2700 Euros (2015). Regular "telex" sheet -teleprinters were much more expensive, and only used at head-offices ("Direktionssitze", "Ämtersitze") and a few major railway stations (ref. 4B). In 1967, DB consumed about 60000 rolls of Hellschreiber paper tape (ref. 4C). In 1968, DB owned 1070 Hellschreiber machines (ref. 4D). Hellschreiber communication was done via the existing private, automated telephone network of the DB: the Bahnselbstanschluß-Netz. The BASA-Netz was in established in the mid-1930s by the Reichsbahn, the predecessor of the DB. It connected all railway stations, controls posts, and offices. Over the decades this network grew to some 120 thousand phone and teleprinter terminals. The DB used Hellschreibers throughout the 1980s (ref. 4E). These machines were used by the German railroad system in the Neanderthal region (i.e., near Düsseldorf) until ca. 1995 (ref. 2C). The last DB service regulations that mention Hellschreiber are from 1983 (ref. 2D). The (quasi-)synchronous Hellschreiber models have an extremely simple printer system. There is no mechanism at all to compensate for the speed difference between the motor of the sender and of the remote printer. This generally results in the line of printed text to be slanted upward or downward, and run off the paper tape. To maintain legibility, the printer simply prints two identical, parallel lines of text - one line above the other. At least one of the two lines is always readable. See the "how it works" page. This works fine, and is robust against interference and signal distortion. However, printing two slanted lines of text requires extra wide paper tape, and also just doesn't look nice compared to a a single, perfectly horizontal line of text. Achieving this requires some form of synchronization between sender and printer. 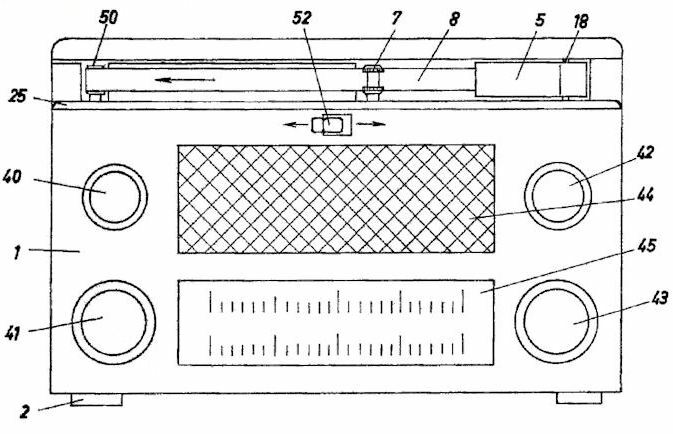 This roots of transmitter-receiver synchronization at character level date back to 1869 (start-pulse patent by Ludovic Guyot d'Arlincourt in France) and the early 1900s (e.g., US patent 1,286,351 filed in 1910 by Howard Krum; ref. 5). Ref. 6. 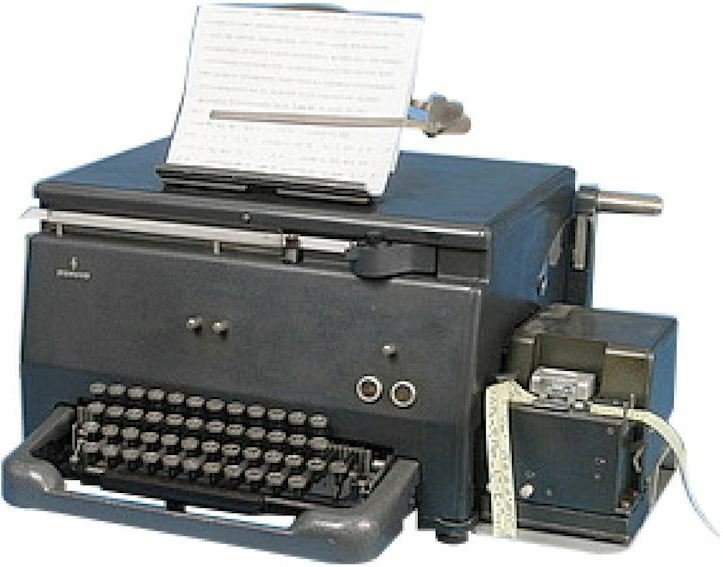 During the 1920s, the Creed, Siemens, and Lorenz companies developed so-called "start-stop" teleprinting machines ("Springschreiber"). They transfer characters as 5-bit codes (Baudot, ITA, or Murray). Each 5-bit code is preceded by a start-pulse, and followed by a stop-pulse. Both sending and receiving machine have a continuously running motor. The pulses are used to (de-)energize an electro-mechanical clutch. Using a clutch avoids the need for a motor with a very high starting-torque (very short spool-up time). The "GL" Hellschreiber achieves synchronization without using a stop-pulse. In some non-Hell start-stop teleprinter systems, a stop-pulse is sent some fixed amount of time after the start-pulse. So it actually provides no information whatsoever, and is not needed for synchronization. Like the start-stop machines, the "GL" machine has a start-pulse tone-detector that drives the electro-magnetic clutch. This clutch couples the continuously running electric motor to the spindle and paper transport mechanism. After a fixed delay time (6 spindle revolutions), the clutch disengages: both the spindle and the paper tape stop. No need for a stop-pulse! The start-stop mechanism significantly reduces paper tape consumption: the paper tape only moves when text is transmitted or received. This also means that the "GL" can be used for unattended operation. Note that the paper tape of the Feld-Hell machine moves continuously, independent of whether or not text is transmitted or received. In start-stop machines, the motor in the receiving station also turns continuously. 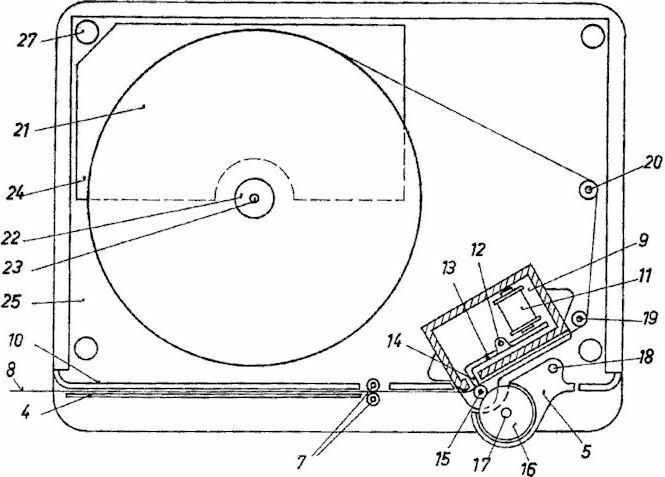 However, the drive-train to the spindle and the paper transportation mechanism is connected via an electromagnetic clutch. As the first (and the last) column of the Hell-font contain no pixels, the start-pulse has conveniently been "hidden" there. As the first column is now not printed anymore, the space between characters is reduced from two, to one column-widths. With the start-stop method, the printer spindle always starts at the correct angle ( = phase). The motors still have different speeds, but the amount of slant that accumulates during the transmission of a single character is completely negligible. As with the Feld-Hell and Presse-Hell, the motor of a "GL" sender and remote-printer are completely asynchronous and their speed will always be different. With the Feld-Hell, these speed differences cause printed text lines to be slanted upward or downward. As the "GL" has synchronization at character-level, accumulated slant is reset for each received character. Text lines of a "GL" are never slanted, only characters. Hence, only a 1-turn spindle is needed, and narrower paper tape can be used (9.5 mm wide instead of standard 15 mm). As the paper tape is only transported when a character is being printed, no paper is wasted when no text is being received (unlike Hell Feldfernschreibers). This enables unattended operation, without the need for a remote control system. Clearly, the required detection of the start-pulse makes this method sensitive to noise/interference (just like "telex" RTTY): an inadvertently detected start-pulse causes a wrong characters to be printed. Conversely, a suppressed start-pulse cause a character to be omitted, and may also lead to a subsequent character-pixels to be inadvertently interpreted as a start-pulse. This is why these start-stop machines (as other teletypewriter systems) were intended for communication over existing telephone lines, and over radio channels with "phone-line equivalent" audio quality (e.g., interference pulses shorter than 3 msec). That is, VHF radio, rather than long-wave and shortwave. This is also why in the 1970s/80s, European amateur radio operators used their "GL" machines primarily in the 2 m band (144-146 MHz), though there also was HF activity, including a weekly net on 80 mtrs. Ref. 7A-7E. 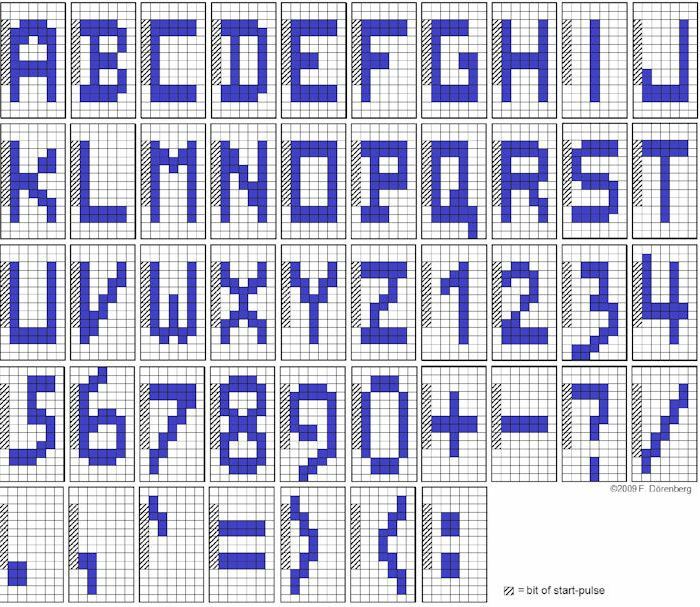 Figure 5: Character set of the "GL"
The "GL" basically uses the same typeface as the Feldfernschreiber, without the pause-character, but expanded with the characters. , ' = ( ) : and some modifications to the E, K, Q, = and ? 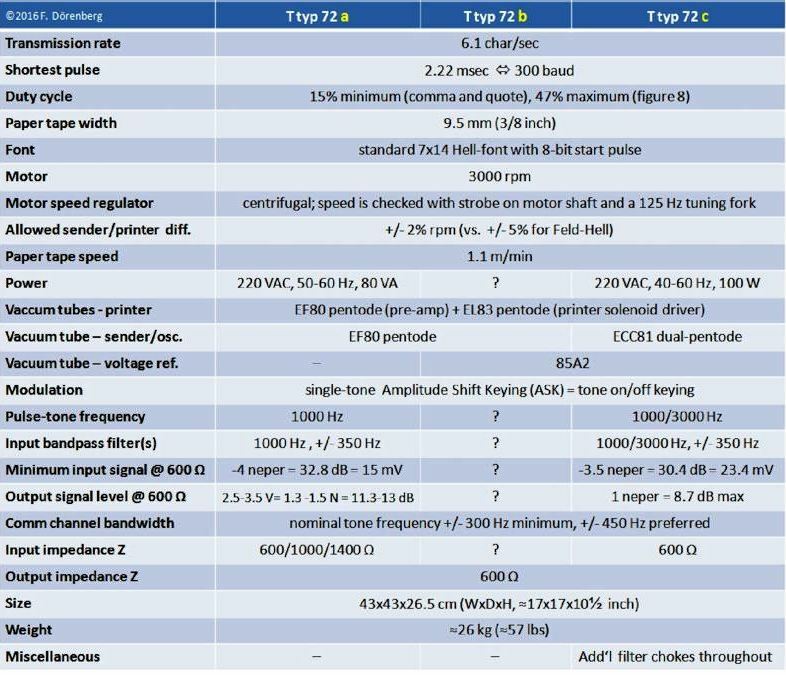 Figure 9: The equipment label of my 72 "GL"
The T.typ.72 was made in three versions: 72 a (ref. 1A, 1B), 72 b (ref. 8A, 8B), and 72 c (ref. 9A-9E). The table below summarizes the main differences. Note that the equipment label in the photo above does not directly indicate whether it is a version a, b, or c, but the "9 St Sk 1211" refers to the c version (ref. 9A). Note that the keyboard of my "GL" machine has rounded rectangular plastic keys. According to Siemens-Halske documentation, the "GL" variants 72b and 72c have round keys, with a metal ring (ref. 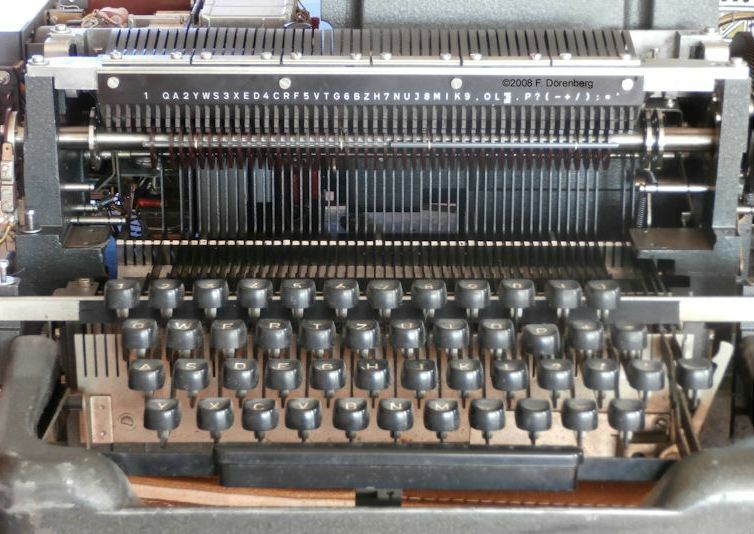 1A, 8A, 9A), like regular typewriters of the era. 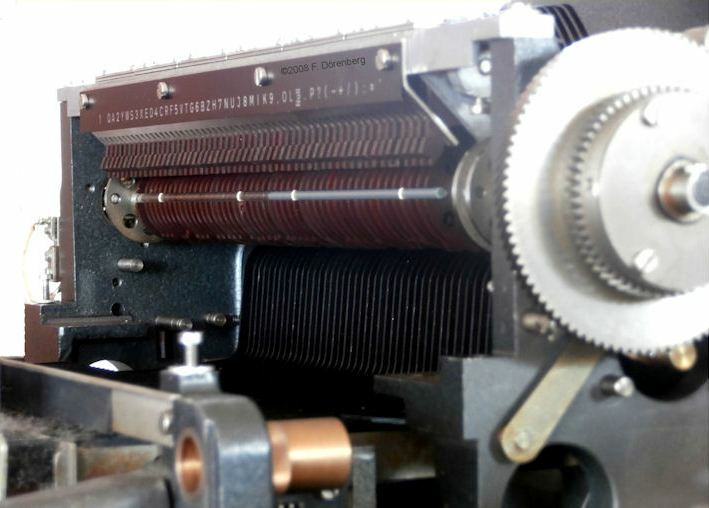 The above photo shows two bronze bushings that are installed horizontally: one just behind the keyboard, the other just below the large brown gear. 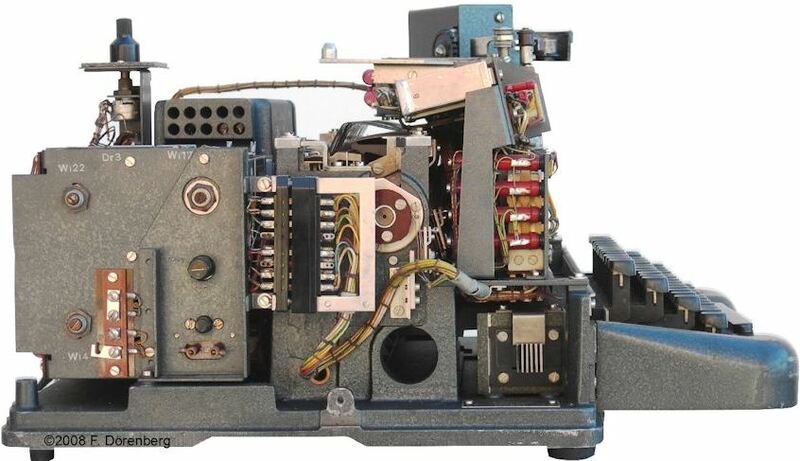 In model 73 "AGL" shown below, they are used to attach a punch-tape reader, That is, the 72 "GL" and 73 "AGL" have the same chassis. As long as the remote-control button is pushed, a constant tone ("Dauerton") is sent to the connected remote T.empf.39 printer. A tone-pulse of at least 1 sec will activate the remote printer, and a tone-pulse of at least 6 sec will turn it off (as with Presse-Hell printers). When connected to a remote printer over regular phone lines, that printer can be activated via the 25 Hz ring-tone signal of the telephone system. A number of years after WWII, the German government provided development aid to Africa. Some of it was in the form of communication equipment, including a couple of hundred "GL" Hellschreibers. Some twenty odd years later, a barn was discovered somewhere in northern Africa, with all these Hellschreibers in it. Turned out that they had never been used, as the US had already shipped teletype equipment to them. 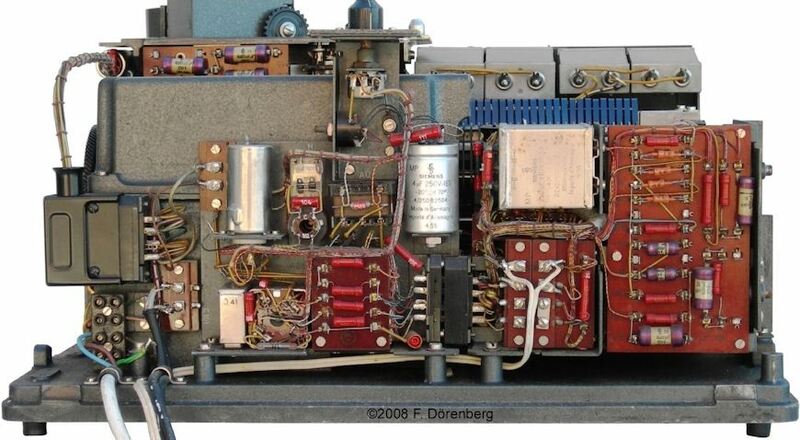 The entire collection was returned to Germany and sold off to radio amateurs [ca. 1974]. They went for 200-400 D-Marks a piece. Fig. 23: Left: status lamps on my machine - "Secteur"="Netz" ="Power" and "Marche"="Bereit"="Ready"
The 3D/stereoscopic photos of my T.typ.72 machine (and other models) are on this page. T.typ.73 "AGL" is an expansion of model T.typ.72 "GL" with a punch-tape reader attachment ("GL" + "Angebauter Lochstreifensender"). As you can imagine, full utilization of the 368 characters per minute capability is only possible via punch tape operation. Ref. 10A, 10B (page 44), 10C. For the complete circuit diagram of the "AGL", see ref. 10D. 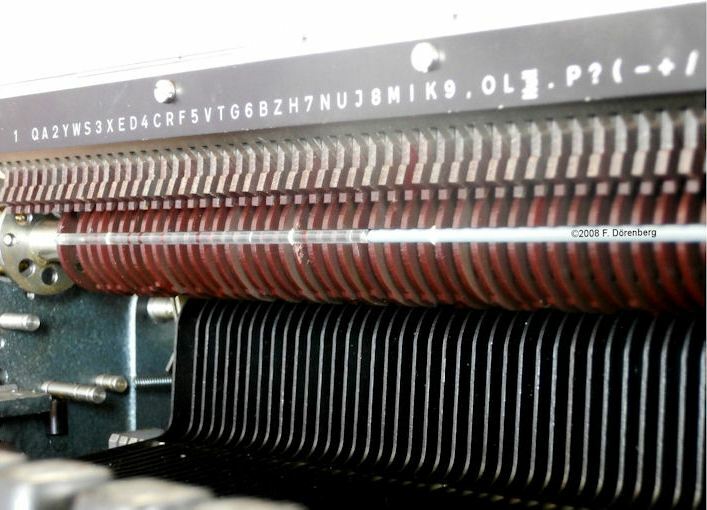 The punch-tape reader also converts from the standard 5-bit International Telegraph Alphabet Nr. 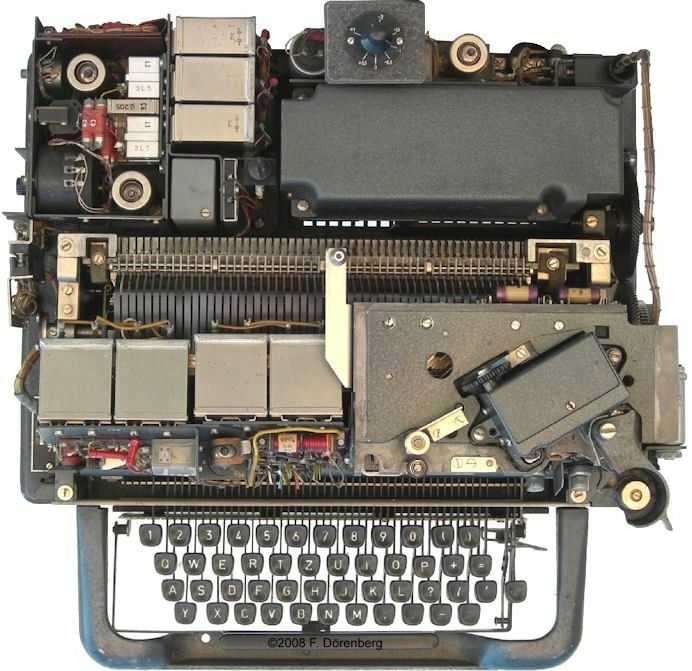 2 (ITA2 ) teletypewriter code. 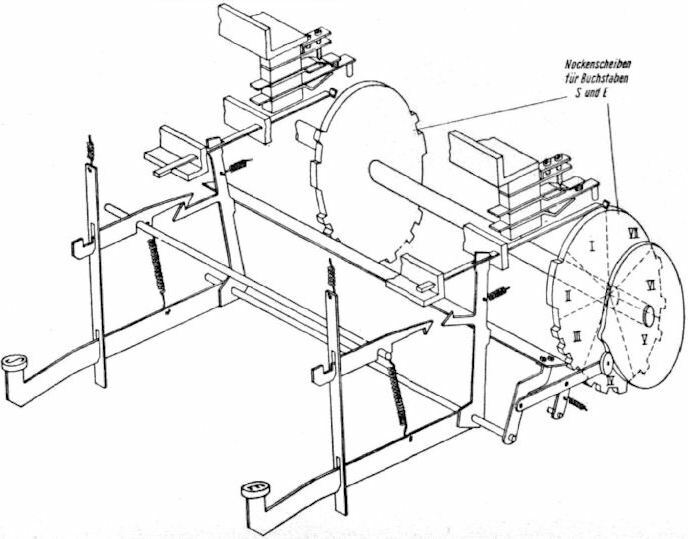 Figure 26: The Siemens-Hell-Schreiber T.typ.73 "AGL"
As shown above for the 72 "GL", the chassis of the machine has two large bronze bushing for attaching the reader. 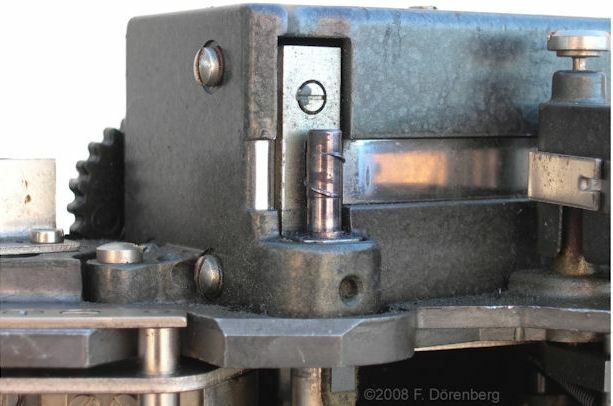 The lever on the back side of the punch-tape reader attachment is used to mechanically engage/disengage the attachment to/from the drive shaft and gearing of the T.typ.72 machine. I.e., to switch between keyboard and punch-tape operation. The Siemens-Halske commercial brochure for the T.typ.72c (ref. 9C), lists the Hell Überlagerungs-Telegrafiesystem (ÜT) unit as an accessory (ref. 11). This is an interface unit for simultaneously operating a start-stop Hellschreiber and a telephone set over a standard 2-wire or 4-wire telephone network. To some extent, it is like a DSL- or ADSL-filter/splitter that was common in the early days of internet modems at home. A standard voice-channel is defined by IEEE as "a channel that is suitable for transmission of speech or analog data, that has the maximum frequency range of 300 to 3400 Hz". The ITU/CCITT standard uses the same bandwidth. The same wires also carry DC power for on-hook/off-hook detection (48 or 60 volt), and a low-frequency ring voltage. Around the world, the ring-signal varies from 15-70 Hz, and 25-150 volt RMS at the terminal. The public and private German telephone systems typically use(d) a 25 Hz ring-signal. The spectrum diagram above shows this superposition (D: Überlagerung). The T.typ.72 Hellschreiber has two selectable pulse-tone frequencies: 1000 Hz (near the middle of the voice-channel) and 3000 Hz (at the high end of the channel). Clearly, using the 1000 Hz tone was not an option. St Sk 5114/1025: for interfacing with a 2-wire phone network. This unit measured 25x13x8.5 cm (WxHxD, ≈10x5x3.5 inch). 9 St Sk 5114/1023: for interfacing with a 4-wire phone network, or with a radio transmitter/receiver. This unit was larger: 30x24x21.5 cm (WxHxD, ≈12x9.5x8.5 inch). It weighed 11 kg (≈24 lbs). A telephone set has a microphone and a loudspeaker. Both are simply 2-wire devices. Interfacing them to a 4-wire telephone system ( = two unidirectional 2-wire lines) is, of course, rather straight forward. However, the Hellschreiber only has a 2-wire input/output. So the ÜT must convert this from 2-wire to 4-wire, in both directions. This is done with a standard converter, called a hybrid or hybrid transformer (D: "Gabelschaltung" = lit. "fork circuit"). The hybrid has additional circuitry to cancel the local echo signal. This is also standard in telephone systems, as are the attenuators at the line input and output of the hybrid. They serve to avoid instability in the network. The voice-signal from the microphone is passed through a Low pass Filter (LPF), to limit its upper frequencies to 2700 Hz. The input signal received from the 4-wire network (which contains both voice signals and 3000 Hz Hellschreiber tone-pulses) is also passed through such an LPF, to suppress the tone-pulses from the signal that is passed to the loudspeaker of the telephone set. Conversely, the tone-pulses from the Hellschreiber are passed through a High Pass Filter (HPF) to limit them to the 2700-3400 Hz band. A second HPF is used to suppress the voice signals from the combined voice + Hellschreiber pulses that are received from the opposite station. Ref. 1A: "Siemens-Hell-Schreiber "GL" T typ 72 a", Beschreibung St Bs 1211/8 [description and schematic], June 1954, Siemens Fernschreibtechnik, Siemens & Halske AG, Wernerwerk für Fernmeldetechnik, 33 pp. Ref. 1B: "Complete schematic of the Siemens-Hell-Schreiber T typ 72a"
Ref. 2D "Vorläufige ergänzende Bestimmungen zur Fernschreibvorschrift (für den Wählbetrieb, den Betrieb von Hellschreibern und das fernmündliche Zustellen und Aufgeben von Fernschreiben)", Deutsche Bahn, Dienstvorschrift 476 b, 1 February 1953 (addendum to DV 476); reprinted 1983. Ref. 3C: "Inflation rate calculator, consumer price index (cpi) and price rise"
Ref. 4: "Signal + Draht: Zeitschrift für das Signal- und Fernmeldewesen der Eisenbahnen"
Ref. 6: "Synchronisierung mit dem Start-Stop-verfahren", Fritz Schiweck, Section 3.5, pp. 90-95, Band 9 of "Lehrbücher der Feinwerktechnik", 4th ed., C. F. Winter'sche Verlagsbuchandlung, 1962, 894 pp. Ref. 8A: "Siemens-Hell-Fernschreiber „GL“ T typ 72b – Bedienungs- und Wartungsanleitung St Wa 1211/11", Siemens-Halske A.G., Wernerwerk für Fernmeldetechnik, SH 2915, 10530.5 T, ca. 1955, 6 pp. Ref. 8B: "Complete schematic of the Siemens-Hell-Schreiber T typ 72b"
Ref. 9A: "Siemens-Hell-Schreiber „GL“ T typ 72 c – Beschreibung", St Bs 1211/2, October 1955, 31 pp. + schematics , Siemens & Halske AG, Wernerwerk für Telegrafen- und Signaltechnik, T Werb 2880 R GN, 956.0,2 [52 MB]. Ref. 9D: "Complete schematic of the Siemens-Hell-Schreiber T typ 72c"
Ref. 10A: "Siemens-Hell-Fernschreiber „AGL“ T typ 73 – Bedienungs- und Wartungsanleitung für den angebauten Lochstreifensender", Siemens-Halske A.G. Wernerwerk für Telegrafen- und Signaltechnik, Fs Wa 1233/4, SuW Bln 05, 559.0.2, January 1959, 4 pp. Ref. 10B: "Dálnopisná technika systému HELL", Rudolf Hanuš, Nakladatelství dopravy a spojů (publ. ), Prague, 1974, 117 pp. ; used with permission. Ref. 11: "Überlagerungs-Telegrafiesystem Hell-ÜT", Siemens & Halske A.G., Wernerwerk für Telegrafen- und Signaltechnik, product brochure, 1951, 2 pp. Ref. 86: "Das Hell-Jahrhundert" [The Hell Century], Lothar Deckert, 2006, Schmidt & Klaunig (publ. & printing), ISBN 9783-8831-2367-7, 182 pp. 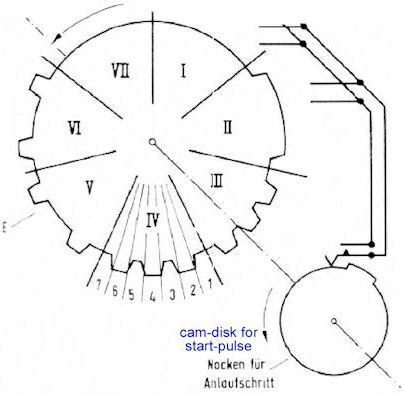 [24 MB] Source: Verein der Freunde und Förderer Technische Sammlung Dr.-Ing. Rudolf Hell in Kiel e.V; accessed 6 March 2019.